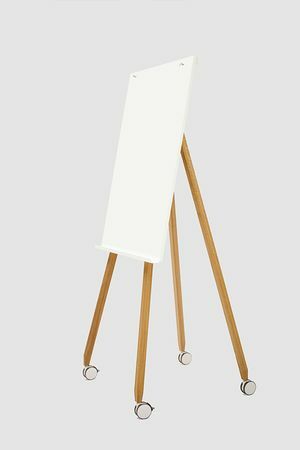 Whiteboards in wood - designed and produced by roomours. Whether it’s for your brainstorming sessions, seminars, or meetings - the optimal way to present concepts and visualize ideas. roomours whiteboards provide the right space for this and are an enrichment to any work environment. With materials such as wood, metal, and felt, combined with a unique yet unobtrusive design, the whiteboards are in perfect tune with the times and blend in perfectly into different room scenarios. Timeless design - intuitive use roomours whiteboards have a lot to offer. The white surface can be written on using board markers and all writings wiped clean using a microfiber cloth. Easily pin, remove and replace notes, sheets of paper, plans, etc. on the board using magnets - our whiteboards are happy to serve you. roomours whiteboards are both versatile and universal. Every board has its purpose. 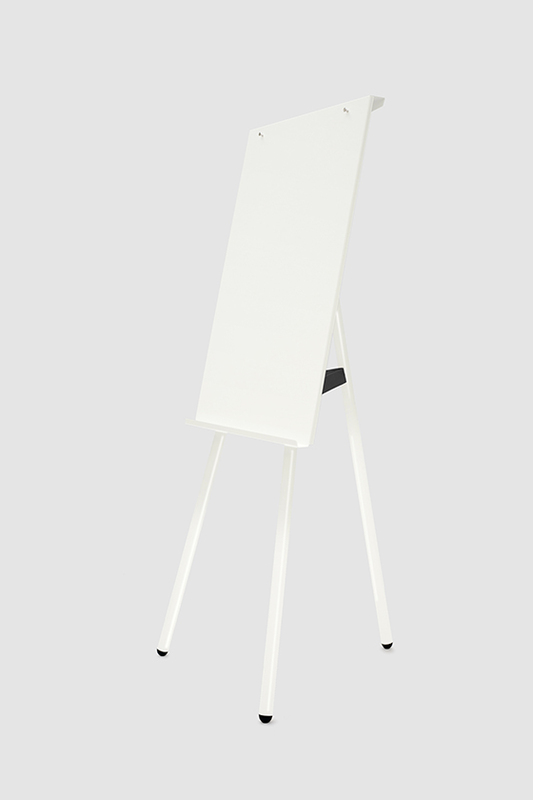 Jack White on Tour - the classic whiteboard - can also be ordered with attachment pins for one or two flip-chart pads - with a slight slope for more comfort. Plenty of room for your ideas - Write It on Tour is double-sided, stands vertically in the room, and is available in five different widths. Change of perspective needed? 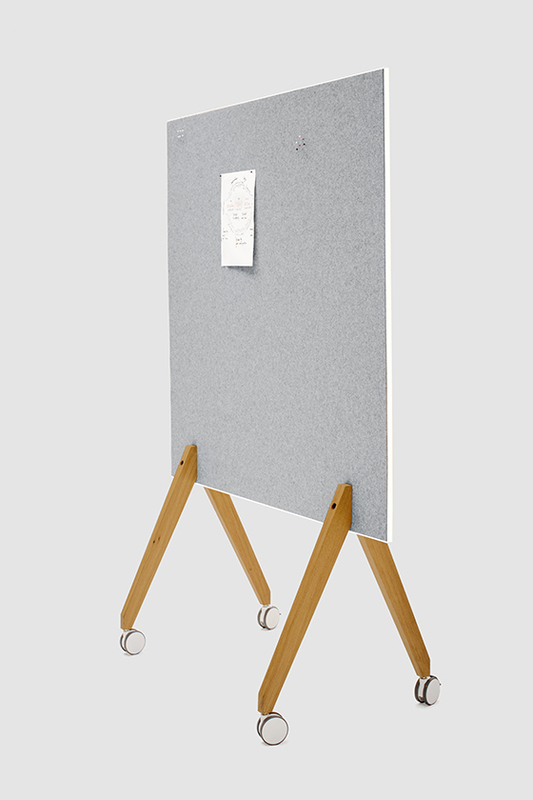 Pin Up on Tour - a pinboard covered with Bavarian wool felt on one side and a whiteboard on the other. Our Keep It tray is a perfect addition to the Pin Up on Tour and Write It on Tour. 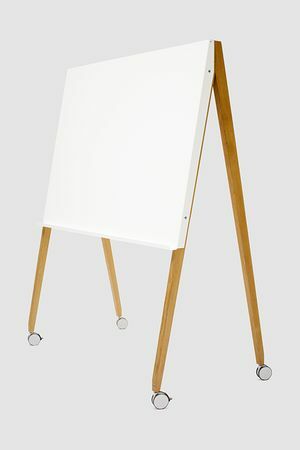 Whether on wheels, foldable, or with a tripod: all our white flip charts can also be used as whiteboards. Write It on Tour lets you write on both sides using chalk or whiteboard markers. A perfectly portable and extremely stable tool. Words, sentences, ideas, sketches, drafts or spontaneous comments can be jotted down, crossed out and easily wiped clean. A bit old-fashioned and pre-digital, yet white and blackboards are an essential piece of equipment in the modern office. Write It on Tour pays tribute to the beautiful art of handwriting. Supports in oiled oak with four lockable wheels. The board is made from a MDF panel coated with a wipeable, magnetic surface in white, green or black. Special features: The white panel is suitable for all types of board markers and dry wipeable. The panel in green or black is suitable for chalk or liquid chalk markers. Pin Up on Tour perfectly combines function and aesthetics and can be used for a variety of purposes. Available in black or white, Pin Up on Tour can be used on both sides. One side has a whiteboard for attaching magnets or writing with marker pens. The other side is a pinboard covered in high-quality felt. Choose from a white panel/gray felt or black panel/gray felt. Supports in oiled oak with four lockable wheels. The board is made from magnetic metal, powder-coated in white or black with a wipeable surface. Special features: The white coating is suitable for all types of board markers and dry wipeable. The Jack White on Tour whiteboard can be rolled into position to captivate audiences, attract attention and keep the ideas flowing. Jack White on Tour handles everything from magnets to Post-it notes and marker pens – and can be easily wiped clean. 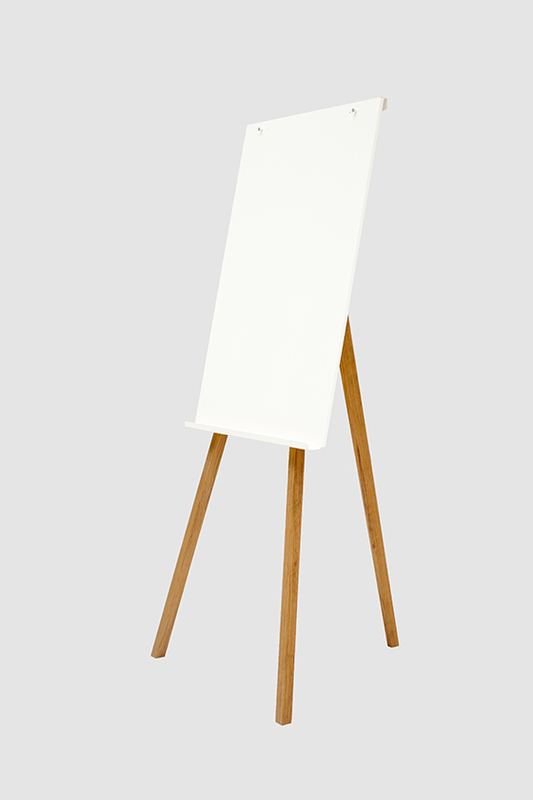 A perfect companion, the narrower Charter on Tour flipchart is made from the same wood to create a perfectly-matched whiteboard/flipchart duo. Sides in oiled oak with four legs and four wheels, two lockable. 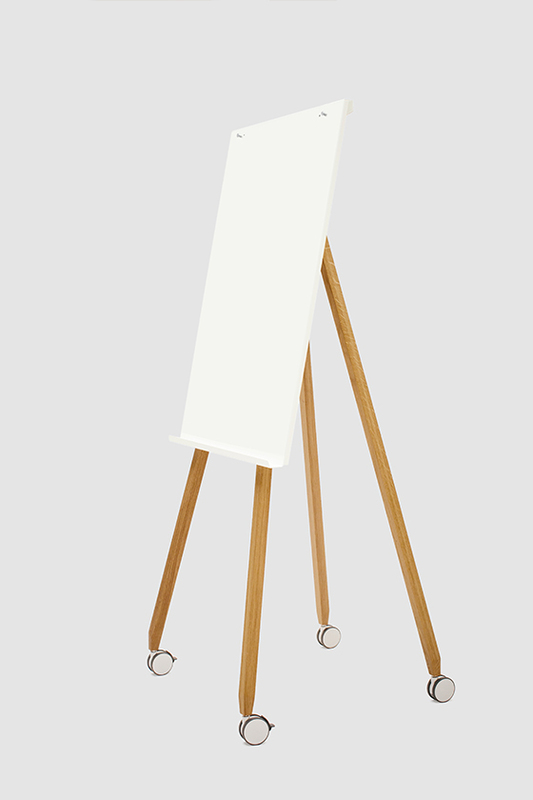 The board is made from magnetic metal, powder-coated in white. The surface is dry wipeable and suitable for all types of board markers. In addition Jack White on Tour can be ordered with the attachment for one or two flipchart pads. Charter is a classic flipchart, an essential tool for conference rooms and the basis for sharing knowledge. Clarity of form and function in an award-winning design. The combination of oak for the legs and metal for the writing board makes it perfect for a variety of environments. Charter has a personality: Absolutely minimalist and anything but rational. Tripod in oiled oak. The board is made from magnetic metal, powder-coated in white, gray, yellow, green and black or in a choice of RAL colors on request. Compatible with all standard writing pads with 50 cm hole spacing. Special features: The white plate has a dry wipeable surface suitable for all types of board markers. The Charter on Tour flipchart is extremely portable – perfect for teamwork and spontaneous informal meetings, anywhere and anytime. It adds a dash of color to conferences and promotes communication and creativity. Its timeless design language is captivating and completely contemporary. Teamed up with the Jack White on Tour whiteboard, it makes the ideal pairing for any imaginable seating arrangement. Sides in oiled oak with four legs and four wheels, two lockable. The board is made from magnetic metal, powder-coated in white, gray, yellow, green and black or in a choice of RAL colors on request. Compatible with all standard writing pads with 50 cm hole spacing. Special features: The white plate has a dry wipeable surface suitable for all types of board markers. 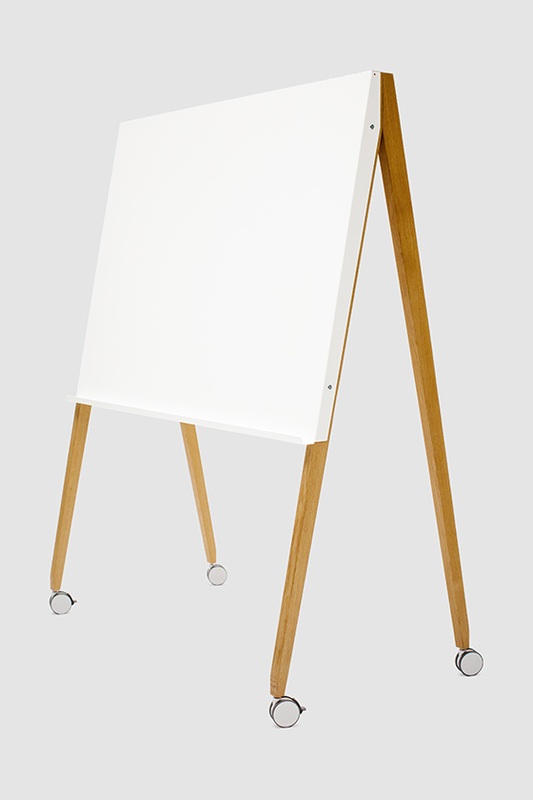 Our Freewheelin' portable flipchart is versatile, convenient and dynamic. Always ready to roll into action, it is a perfect partner for the stationary Charter model. Tripod in oiled oak with four legs and four wheels, two lockable. The board is made from magnetic metal, powder-coated in white, gray, yellow, green and black or in a choice of RAL colors on request. Compatible with all standard writing pads with 50 cm hole spacing. Special features: The white plate has a dry wipeable surface suitable for all types of board markers. Perfect for team projects, workshops or informal meetings in this room or that, Flipchart Foldable is amazingly portable and practical. It can be folded flat and leaned against a wall ready-to-use. Flipchart on a tripod with foldable middle leg. The powder-coated, magnetic metal board is available in white, black or any RAL colour on request. Accepts all standard pads. Special features: dry-wipe white board suitable for all board markers. The Clean Up microfiber cloth is intended for professional cleaning of our whiteboards, flip charts, and pinboards and should be used dry without addition of chemical cleaning agents. It gently removes marker residues without leaving any scratches, streak-free and lint-free. You can wash the Clean Up microfiber cloth in the washing machine. When washing it for the first time, please wash it separately since the cloth can discolor. We recommend Oranex cleaning agent for basic cleaning of the surface or if the board has erroneously been written on using permanent markers. The cleaning agent easily removes all writings on the board. Cleaning with Oranex once a month is advised depending on the use and the amount of stains on the board. We recommend the Lumocolor whiteboard markers from Staedtler for our white boards. They have a 2mm line width, dry fast and are odorless and refillable. The DRY SAFE system means that they can be left open for days without drying. The blocked tip keeps it from being pressed into the shank, even under very strong writing pressure. Writings using the whiteboard markers from Staedtler can be wiped off the surface of the flip charts and whiteboards without leaving any marks. Staedtler whiteboard markers are refillable and hence environmentally friendly. Writings using the Lumocolor whiteboard markers from Staedtler can be wiped off our whiteboards and white flip charts dry and residue-free using a microfiber cloth. We offer the whiteboard markers individually in black or as a set of four or eight colors. However, our whiteboards can also be used with any standard whiteboard marker. All surfaces that can be written on using whiteboard markers have a glossy surface. We use white or black castors with a diameter of 80 mm for all our mobile/rollable communication tools. Due to the soft running surfaces made of polyurethane, our castors have very low friction and function perfectly on carpets, parquet, and stone floors. For optimal stability, the two front castors on flip charts and all four on white-, pin-, and glass boards are lockable using a simple castor lock. The castors are noise-free, abrasion-resistant and do not discolor, i.e. leave no traces on the floor. 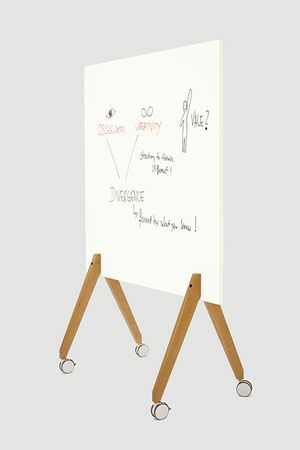 All flip charts from roomours are compatible with any standard flip-chart pad with 50cm hole spacing. As of late, we also offer our own pads consisting of 90g paper with a very discreet roomours logo. The upper part is perforated at 40 mm and can be torn off very easily. The sheets of paper come from responsible sources and are FSC certified. Our pads are packed flat in a resealable box with ten pieces and can also be transported this way. As a result, the common wavy “flags” on pads previously delivered in rolls are now a thing of the past. We offer magnets for our white- and chalkboards. The magnets are very powerful, unobtrusive, and can hold up to ten sheets of paper. They can be used on all flip charts, whiteboards, pinboards, etc. and are available in a set of 10. We believe that our high-quality and beautifully shaped products should always be close at hand for meetings, trainings, and workshops. However, we understand that the available space is not always adequate for permanent integration and have therefore developed a foldable flip chart. This can easily be stowed away when space is limited and later set up just as easily for trainings, events, etc. 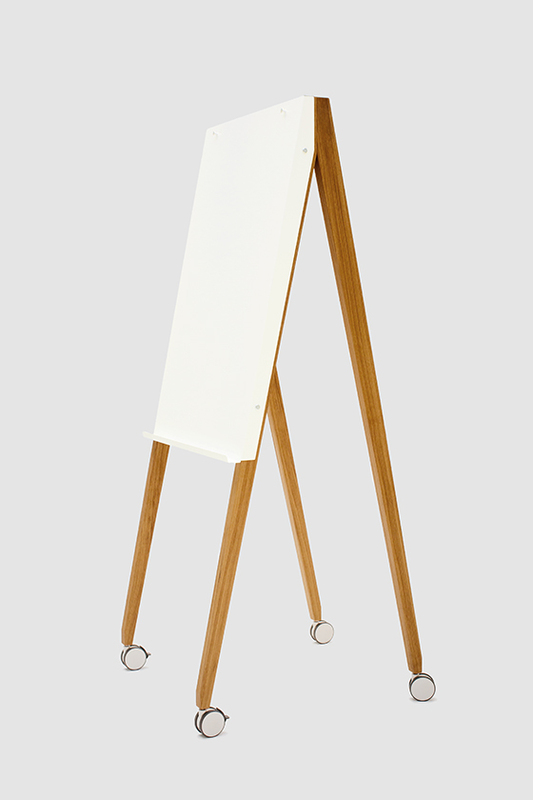 Just like Charter, the Foldable flip chart stands on a stable tripod in oiled oak. However, unlike Charter, our Foldable does not have square, but round legs with a diameter of 40 mm, which gives it a high-quality look. It can be leaned against the wall and, complemented with the spacious pen tray and our new flip-chart bar that holds your papers in place, is an ideal companion for mobile use in buildings. Foldable comes fully assembled and is ready to use. Oranex is a cleaning agent that is particularly suited for thorough cleaning of writable surfaces. It easily removes all residue left over from the use of marker pens. Cleaning with Oranex once a month is advised depending on the use and the amount of stains on the board. To ensure good writability of the surfaces, it is advisable to rinse the surface with clean water after cleaning with Oranex depending on the concentration of the cleaning agent. Oranex is applied dilute and cleans all washable surfaces gently. The natural cleaning agent is an environmentally friendly, orange-based cleaner consisting of orange oil and orange terpenes. It can be applied in the smallest of amounts to wipe off stains and persistent marks with great effect. Our furniture polish is designed for regular care of treated wood surfaces. It keeps the wood from drying out and protects it against dirt and moisture. It is an easy to use, waxy polish that is ideal for intensive maintenance. It revives and maintains the natural structure and tint of the wood, thus ensuring a beautiful and durable surface. Only high-quality and natural raw materials are used to manufacture the polish.